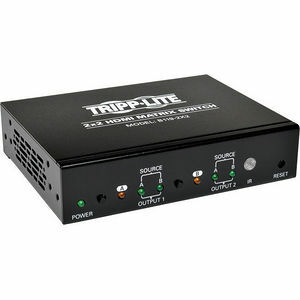 Tripp Lite B119-2X2 is a 2x2 HDMI Matrix Switch that routes high definition video from any two HDMI sources to any two HDMI displays. It supports video resolutions up to 1920 x 1080 (1080p) @ 60Hz. The 2x2 Matrix eliminates the need to disconnect and reconnect HDMI sources. It works with any HDMI source that connects to an HDMI display, and each source is accessible at all times by any display by selecting it with an IR remote, or using the RS232 port to switch the unit.